Review of BlenderBottle SportMixer 20 oz. and 28 oz. This is the summary of consumer reviews for BlenderBottle SportMixer 20 oz. and 28 oz.. The BoolPool rating for this product is Very Good, with 4.40 stars, and the price range is $10.52-$14.99. The BlenderBottle SportMixer is made of premium Odor-resistant Eastman Tritan plastic with embossed ounce/milliliter markings for easy measuring and large drink spout. The feature-rich design makes it a perfect hydration companion, while the patented BlenderBall wire whisk quickly mixes even the thickest energy and nutrition shakes with ease by breaking up clumps or lumps. Ensure to screw the lid firmly on the cup followed by a snap press on the flip cap to avoid leaks or spills. The surgical-grade stainless steel ball is designed to stay in the bottle along with the contents making it safe to consume. The contour shaped rubberized SportGrip offers a firm and secure grip for best mixing action. The StayOpen flip cap does not close on nose and the convenient SportLoop makes it easy for carrying. These bottles are dishwasher safe, making it easy to clean and are BPA-free. However, the Sports collection is not microwave safe. Some reviewers also mentioned the size of the cup mouth is smaller which restricts hand cleaning and difficult to fill with large scoops of ingredients without making a mess. Overall, the BlenderBottle SportsMixer is effective for blending and carrying tastier and healthier nutrition drinks. These bottles are available in many attractive colors. 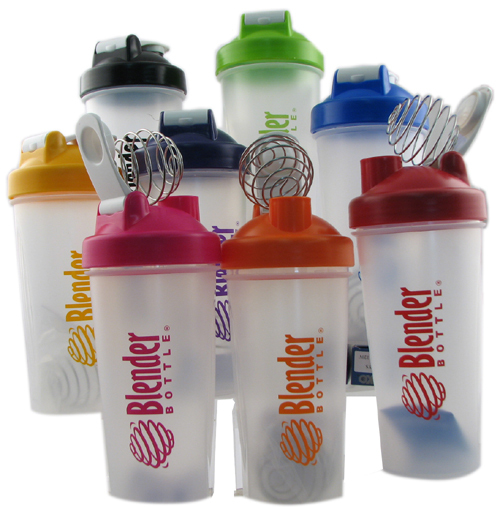 The BlenderBottle SportsMixers are easy to use in kitchen, offices, and gym or even while travelling. This's the perfect size I was looking for the gym and work. Perfect size, easy to clean, awesome grip and ring on top for convenient carrying. It's good looking and trendy, leakproof, easy to wash; its capacity is just right for storing enough liquid for a training session. No complains prefect, good looking hold alot of m protein and no more cluster. The color was what I was looking for. Best Protein shaker I've ever bought. this thing isn't only functional it looks badass with the red and black. It was very convenient and easy to use. This newer model also looks a bit less goofy and the top is more secure (the older one leaked slightly when I shook it). Hell I'll even goes as far as to say it even looks stylish. They don't leak at all and work great with mixing up protein. This product came very quick and it's a great product. I'd recommend this product again. This product is exactly what the description said on the web, great quality easy to wash and perfect for on the go proteins. They work great especially with the protein powders that call for bigger scoops like the mass gainers. I was nervous about buying this after reading some of the negative reviews about it leaking, however I've found that it's of quality construction with no leaking whatsoever for me. Get me going with my protein drinks to go. Looking nicer than the classic blender bottle but this new bottle has a narrow opening which makes very difficult to clean inside and the white opening is very hard to open. I also love that the flip-top lid is VERY secure and won't open unless you want it to open. Yes the top can be hard to open also but most shakers are like that. Did I also mention I can't fit my hand in to clean it, the original has a large opening. Top is hard to open and close, sometimes I think it's closed and it's not, only to spill later. Cons: Can't fit your hand inside narrow top to clean it. I'm sure with time it'll get easier to open. no leaks, you've intentionally open it, it wont just open on its own. I love that the whole top comes off, but still has a small drinking hole. Sometimes can be hard to open lid as the grip band turns as you turn it, the grip band is supposed to make that easier!! I was searching for a water bottle that held a lot of water & ice and had a big drinking spout. This bottle has a great seal and makes making my protein drinks super easy. If you like the style, you're better off buying a water bottle and just shaking your drinks in there because those won't leak. My granddaughter uses hers for her protein drinks and just as a handy drink bottle for her water or whatever. I've several Polar bottles with squirt tops, but I can't ever seem to drink the water fast enough. easy to clean, bpa free, tint makes it look like a regular water bottle so you don't have to answer any of those what're you drinking questions. This Blender Bottle fit the bill! And bottle opens wide by unscrewing whole cap so can fill with ice, but still drink from smaller opening when cap is screwed back on. I prefer it that way since some of my other 20 and 28 oz regular Blender Bottles have extremely difficult to open lids.